Well, I thought this was finished, but I’m asking for that last little bit of help. 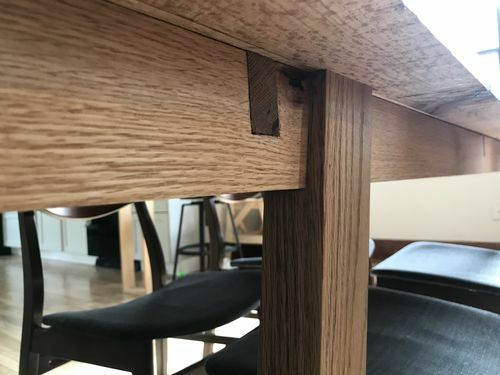 This table has been constructed with wood joinery and glue, no screws. I was pretty proud of it, but unfortunately it’s not extremely sturdy. You can see in this video, when I put pressure on the table, it rocks back and forth. This is mainly noticeable when someone goes to sit down and puts pressure on the table as they’re getting in their chair. This may be due to a couple of problems. 1) For the most part, the dado I cut at the top of the legs provided a very snug fit which I glued in. In one or two of the legs, the dado was probably 1/16 of an inch too wide, so left a tiny wiggle room. Well, I should’ve paid more attention while gluing, because two of the legs aren’t perfectly square. You can see in the image where I show the short side of the table what I mean. I suppose I didn’t take the photo directly in front of the main problem leg, so the issue looks even more severe in the photo, but you can see the left leg tapers in a bit. The right leg tapers out a tiny bit. I can manually push these in place, but it seems they just slide back in to their original place over time. 2) I obviously don’t have any stretchers, as I wanted a very minimal design. Do you guys think if I put a stretcher connecting each set of legs, that would help with stability? Or would I need to do that, PLUS having a stretcher that attaches both sets of legs, running through the middle of the table, as well? I’d be happy to add the two stretchers to connect each leg set, in fact, this may help square up those two problem legs. But I’m worried if I add a middle stretcher, this narrow table won’t allow for people to scoot in without banging their legs. Thoughts? I wanted a minimal design, but I’m thinking that this might be too minimal even for more skilled woodworkers, and due to the nature of gravity, you just need more stability. It’s a really cool looking table I like it. I looked at the video and I do agree it will need stretchers. Have you thought about bring some 2×3 or something you would use and c clamping them to the legs where it sits. I think that will help you find that sweet spot for both looks and wobble. I also think something need to be done with the connection at the top of the legs. I just don’t know what I’m too far away. I like the look of the table. Have you considered adding some bracing at the top of the legs? Something at a 45 degree angle between the legs and the bottom of the top? You might be able to get by with a brace that doesn’t extend below the apron. 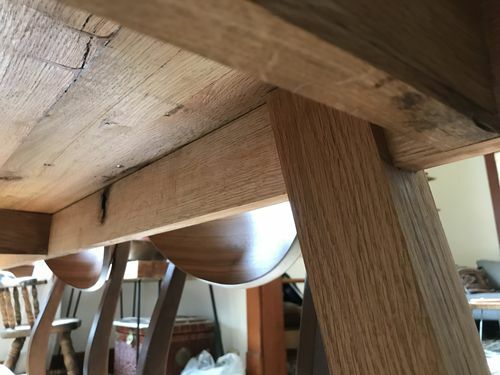 The angle could be even longer to get one leg of the brace closer to the center of the table. At the end of the video, it looks like you can see the apron is sort of wobbling in the slot on the top of the leg. I don’t remember ever seeing a table leg attached like that. Did you try driving some shims or small wedges in the gaps to see if that helps? If that helps, I would glue them in. If you can get the leg off, you could glue some veneer on the apron of the cheeks of the slot on the legs to make it fit tighter. If you use hide glue, you’ll be able to reverse it later if it has to be repaired again. Thanks for the help everyone, these are great tips that I will put to practice! It appears that the legs are joined to the aprons with a bridle joint. I don’t think you’ll be able to get rid of all the racking by just making a tight connection at the apron. I think you need to tie the legs together. 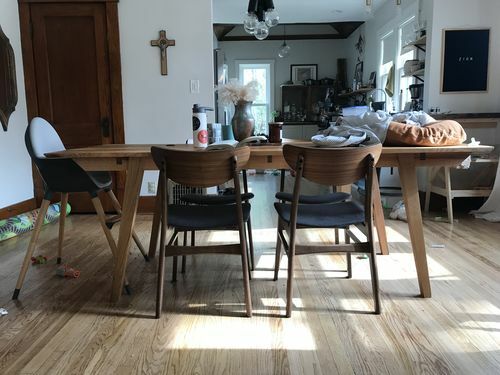 Perhaps you can add cross braces (on each end) under the table between the tops of the legs and then another just below but high enough that your legs won’t hit when you sit close to the table? I wonder if the cross grain glue joint between the apron and the leg is a potential problem? If the leg and/or apron changes dimensionally due to moisture—you may get some splitting/cracking. I thought you said you glued that joint—if I read that wrong please ignore this.